I don't know how, I don't know why. It was never my plan. To think of even touching a fish creeps me right out. I don't allow the thought of cleaning them (oh ick... a thought just crept in...) or eating them. The smell can drive me over the edge (especially that "fresh" fish smell) and when I'm in the grocery store I hurry past the fish on ice as quickly as possible - averting my eyes all the while. 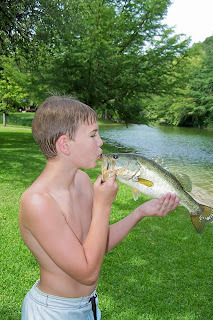 Nevertheless, there's this boy in my house that eats, lives, and breathes fishing (well... not "eats"... there's that vegetarian thing...) He'd fish every day from sun-up to sundown if I'd let him. Actually...this kinda works to my advantage. You say you'd like to go fishing with Grampa this morning? How's that schoolwork coming along? Did that garbage make it to the curb? What's that I smell? Catbox? Are those dust bunnies I see? All three of the kids keep a tackle box now - each full of disgusting implements, some with dried worm guts on them. They love to go through their tackle, sorting, organizing and comparing equipment, carefully cutting out pictures from the latest Bass Pro catalog and taping them to their respective fish-wish lists. 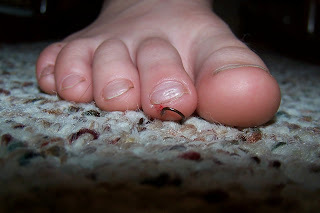 I try to keep the tackle out of the house, but now and then... a stray rubber worm or tiny hook gets overlooked. Not to worry, though... Eventually, all things are found. Even the stray hooks. 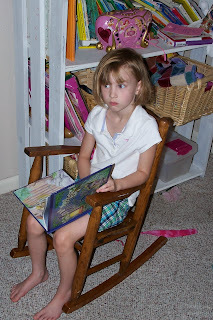 It was pretty unusual for Michaela to sit still reading for any period of time, but having a fishhook through her Mommy Toe (the Mommy Toe because it's beside the Daddy Toe on one side and the Zachary Toe on the other side...) was all the persuasion she needed. I will admit, part of me enjoyed the sitting still part a little bit. I know... this is pretty unnerving... but it looks worse than it really is. She didn't even cry at all - it's a mere flesh wound. Still makes ya' wanna wear your shoes in the house though, doesn't it? 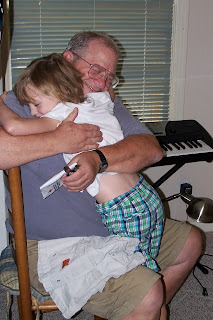 Fishing does endear them to their Grampa... especially when he's the one that cuts the hook that holds you hostage to your bedroom carpet. 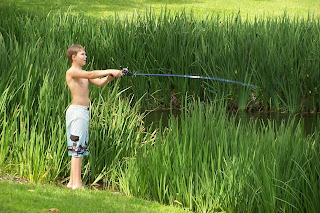 Mayhaps your young vegitarian fisherman is practicing up to be a "fisher of men"? Ouchy for Miss Mac! I'm still gonna run around barefoot though! I have to ask..was that planned cause I'm having problems getting H to sit still to read??? That's funny! I never connected the fishing with being a vegetarian. So what do you do with the fish? That is great that everyone has a hobby. 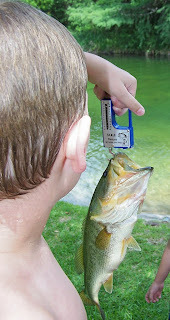 My boys are strictly on a catch and release program. Hope you are having a happy summer. Ewwww.....I don't think I have ever known anyone quite like you my friend!!!! Your love of all things gross just astounds me!!!! Ewwww...you crack me up with your love of all things gross. I have gotten the best hugs from your Mack the last two days!!!! Oh, and he always baited the hook. And cleaned them. Sorry about the hook, but what a wonderful thing to have special fishing time with Grampa. Hi family!